From the Miami International Airport, take LeJeune Road south to 836 West. Take the Florida Turnpike south towards Key West. From the Fort Lauderdale Airport take I-595 west about 2 miles and take the Florida Turnpike south towards Key West. You will go through automatic tolls to get to Florida City. If you miss the Florida Turnpike you can go another 6 miles, then take I-75 south, about 8 miles. After you pass the Miramar exit get in the right lane and take the turnpike south towards Key West. The Florida Turnpike ends at US 1 in Florida City. 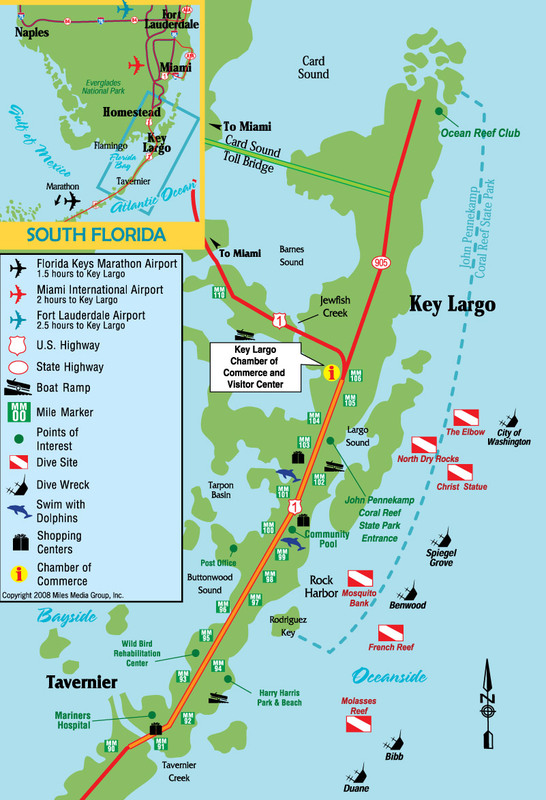 Follow U.S. 1 south about 22 miles to Key Largo. Sanctuary Drive is near mile marker 100. Click twice for larger views. We are located bayside at MM100.